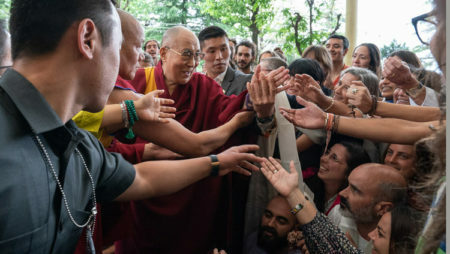 April 16, 2018, Thekchen Chöling, Dharamsala, HP, India – His Holiness the Dalai Lama was in a jovial mood as he emerged from his residence this morning. He greeted the more than 1500 visitors from 68 countries who had gathered in the temple courtyard, shaking hands with some, teasing and exchanging a few words others. He gradually made his way round the yard, stopping to pose for photographs with people grouped according to their geographical origins, before sitting down on a chair in the porch under the temple. “For some time I’ve thought that when there are brothers and sisters from different countries here,” he told the crowd, “just seeing my face is not sufficient. I want to show how brilliant my brain is by talking to them. 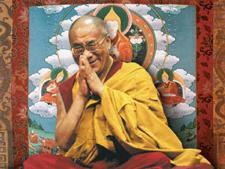 His Holiness expressed admiration for vegetarianism, and declaring that the kitchens of Tibetan monasteries and other institutions in exile are largely vegetarian. However, he also explained that Buddhist monks’ traditional dependence on alms prevented them from expressing preference. Therefore, they are neither vegetarian nor non-vegetarian. Finally, asked to clarify what he meant when he declared that compassion is not a luxury, but a necessity if we are to survive, His Holiness pointed out that science and technology have give human beings an immense power of destruction. At the same time reality has changed and people are now more interdependent than ever before. Climate change, for example, is a threat that affects everyone and which can only be addressed by everyone working together. There is an urgent need to be realistic and understand that since problems can’t be solved by the use of force, the only alternative is to seriously engage in dialogue. His Holiness got up and walked at an easy pace down the temple yard, taking time to accept people’s greetings and salutations as he went, before climbing into the car that would take him home to lunch.